In a test of equipment that might one day be used to search for biological activity on Mars, researchers discovered life tucked deep inside a frozen Norwegian volcano. The test region is said to have geology similar to that of Mars. 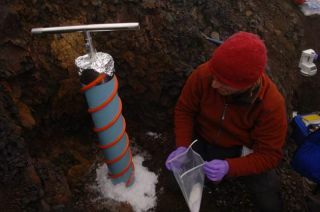 "We tested equipment that we are developing to look for life on Mars and discovered a rare and complex microbial community living in blue ice vents inside a frozen volcano," Hans Amundsen of the University of Oslo said today. "The instruments detected both living and fossilized organisms, which is the kind of evidence we'd be searching for on the Red Planet." Amundsen leads a group called the Arctic Mars Analog Svalbard Expedition, or AMASE. Previous work by the group uncovered life in the barren region above the Arctic Circle last year. The new discovery involves a unique community of microbes deep within the volcano. "Ice-filled volcanic vents, such as these, are likely to occur on Mars and may be a potential habitat for life there," said Carnegie Institution researcher Andrew Steele, science leader of the project. Some scientists think life on Earth may have begun in and around volcanoes. The AMASE scientists found signatures of microorganisms and fossils embedded in the volcano's ice and on surfaces and cracks of rocks. "Our instrument, designed by scientists at the Jet Propulsion Lab (JPL), detected minute quantities of aromatic hydrocarbons from microorganisms and lichens present in the rocks and ice," said JPL researcher Arthur Lonne Lane. One goal of the program was to find out if the instruments could be kept sterile, so that they would actually detect life in the volcano rather than fool researchers by detecting life from aboveground that only appeared to have come from below. The concern, with a mission to Mars, is that microorganisms from Earth might hitch a ride and get "discovered" on Mars. "We performed several successful tests with a miniaturized instrument fitted with special protein microarray chips," says Steele. "Our results showed that we were able to maintain sterile sampling procedures without introducing contamination from humans." The newly found terrestrial creatures are hardy. "The organisms found in ice are survivors," said Liane Benning, University of Leeds. "Small ecosystems in the ice have apparently adapted to extremely cold conditions." Separate recent research revealing methane in the atmosphere of Mars suggests to some scientists that life might lurk in ice packs just under the surface.